As we have highlighted previously, a false-negative finding – where a tumour is missed during breast cancer screening – can have devastating consequences for the woman concerned. Nancy Cappello has described this is as the “happygram” when the mammogram does not reveal an underlying tumour and the woman returns home, happy in the knowledge that she is cancer-free. In the mean time the cancer continues to grow and perhaps to metastasize, so that by the time the diagnosis is made, the treatment costs have escalated and chances of a successful outcome have diminished. An interval cancer may be defined as a breast cancer diagnosed in a woman presenting with symptoms within one year of a negative screening mammogram. It is therefore crucial that interval cancers be reviewed by the radiologists responsible for a breast-screening programme. Based on a study of 231 false-negative screenings, Hofvind and colleagues characterized interval cancers as: “missed,” where cancer was clearly present in the screening mammogram (35%); “minimal sign,” where subtle or slowly developing signs were present (23%); and “true negative” in 42% of cases. 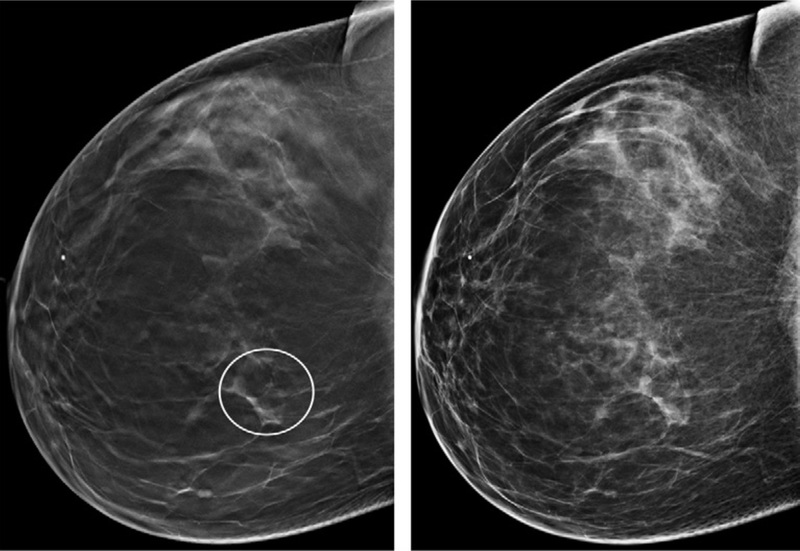 In an effort to explore strategies for increasing cancer detection rates, Dr Katrina Korhonen reviewed true-positive and false-negative results when employing digital breast tomosynthesis (DBT) as a screening modality. She and her colleagues at the University of Pennsylvania have just published their findings in RadioGraphics, in which they reported examples of cancers that were occult in full-field digital mammography (FFDM) but were diagnosed with DBT. 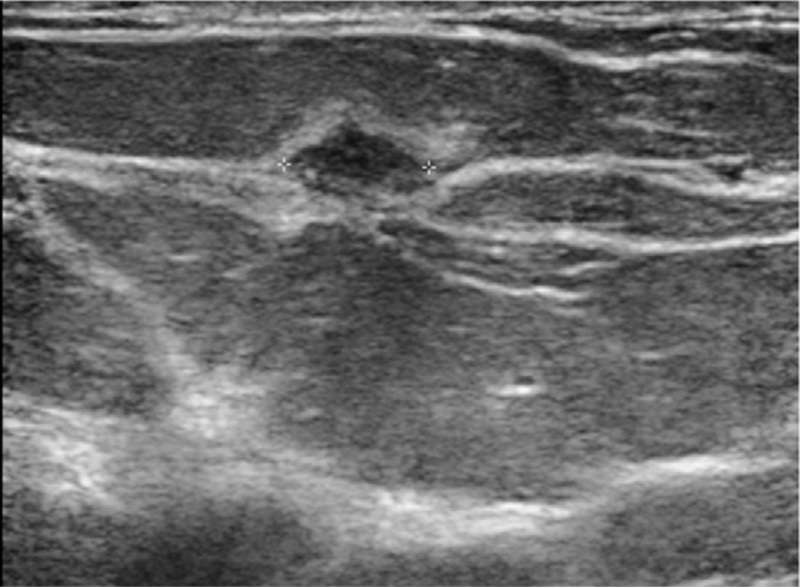 However, there were occasions when both the DBT and FFDM images were initially interpreted as negative (see above right, © RSNA), and a patient-requested ultrasound (see above left) revealed an intermediate grade ductal carcinoma. The authors acknowledged, “Although the false-negative rate of DBT screening is less than that of screening with FFDM alone, some cancers are still difficult to detect or nondetectable with DBT.” This begs the question: Would not the solution to the false-negative conundrum be addressed by combining FFDM with automated breast ultrasound (ABUS) – such as CapeRay’s Aceso system – or even combining DBT with ABUS? Everything in this field depends on what you mean by screening. In the Netherlands this means a complete outside the healthcare centrally organised and monitored system. We have dual reading since the start of the screening (1990) with audits and reviews of interval cancers with certified screening radiologists. The balance of the complete program is made every year by a organ with epidemiologists (LETB). For this you need a watertight system of a screening information system and a Cancer Registration. The room for improvement is in such a system limited. But only a couple of countries in Western Europe (and the UK) are capable of organising this on a continuous yearly basis. But for those countries where “screening” is “investigating women without symptoms”, without much follow up information, the merge of mammography and ultrasound during one acquisition is still a very good approach.